Even though it’s Thanksgiving week and I’ve been blessed with family visits, good food, and a break from classes, the impact of Monday’s Ferguson grand jury announcement has been lingering just below the surface. I’ve tried to keep abreast of developments and not chase down too many rabbit trails but I’ve still had the sensation that we were missing something important. I came across the expected social media pronouncements: Voddie Baucham announced that Michael Brown simply reaped what he sowed; the key to not getting shot is to obey police officers’ instructions, according to Rod Dreher and others. Then there were those creating Facebook groups that called Darren Wilson a murderer. Neither of these approaches are helpful nor true to the facts of the case as generally understood. There is nothing about stealing some cigarillos that draws a straight line to a shooting. Even if there had been an indictment, there is nothing about Wilson’s decisions that would support a verdict of murder. We seem stuck between a Progressive view focused on systemic injustice and a Conservative view focused on individual action. Somehow, we need to spend more time trying to work through the linkages between these ideas without simply positioning one against the other. But intelligent Christians operating out of a biblical worldview know that this is not just a problem for Ferguson. It is the problem of the human heart. The NFL’s Benjamin Watson wrote a marvelous piece describing a range of emotions in light of the decision yet ended up saying that “this is not a SKIN problem but a SIN problem”.But it’s usually from individual out (Mohler, problem of human heart, NFL player, individual forgiveness). Of course, Bauchman is right to point out that everyone who commits abuse of some kind is a sinner, but it’s not clear, nor is it at all substantiated in this article, why a cop who racially profiles a black man is not a part of a larger system of abuse. Watching all this unfold got me thinking that our view of sin has been distorted by the rugged individualism of our culture and the crisis decision approach to evangelism. What need a more robust sociological linkage between the individual and systemic level of thinking about sin. We’d have better responses if we could envision how this process works. Sociology isn’t particularly good at issues like sin. Maybe that’s the concern that recognizing social contextualization opens the door to moral relativism. But there are real issues of human nature at play. One of the fascinating things about teaching sociological theory in a Christian university is introducing students to Karl Marx’s naive view of human nature. He believed that people were essentially good and that systems corrupted them. If they could throw off those constraints they’d be free to act morally. While Marx’s view of human nature is hard to square theologically and experientially, his observations on the impact of the systems in which we’re imbedded weren’t completely wrong. Back in May I wrote about Antony Giddens’ Theory of Structuration. The central thrust of his argument is that structure and identity are not dichotomies to sort out. They actually form a duality, two sides of the same coin. The processes operating systemically are reproduced at the level of individual choice and behavior. The processes of individual choice and behavior shape and legitimize the structural contexts in which they occur. This happens through a process of Recursive Discourse, in which we use shared language to define our choices and contingencies and act through that linguistic structure in interaction, thereby replicating the structures along the way. This is saying much more than “one affects the other”. 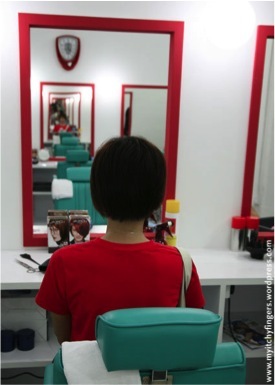 Like the barbershop mirrors in the picture, one cannot separate the never-ending recursive loop in play. Seeing this process recursively has some interesting dynamics when it comes to wrestling with our understanding of sin. John Wesley defined sin as “a voluntary transgression of a known law of God.” We tend to see this as individually based; Wesley most likely did. But the structure of the phrase is interesting. Voluntary. Known. Law. God. What does it mean to act voluntarily? When is context so oppressive that is renders one’s choices so limited that the full meaning of volition is distorted? Are there times when we are reacting to a situation without considering alternatives or consequences? Which laws receive prominence? Old testament strictures? Love your neighbor as yourself? The Sermon on the Mount? Then there’s the risk that we’ll substitute civil law for the Law of God. We like to quote “your ways are above our ways” but we often seem to elevate our ways to heavenly status when defining what is sin. All these questions bang around in my head as I try to make sense of what happened in Ferguson in August. The more I read of the grand jury evidence, the more I see recursive discourse in play. Given the context of racial profiling, what does a young black man think when a police car goes by, stops, and rapidly backs up to make lone contact? What does a police officer think about a robbery suspect he heard about on the radio, especially one he sees as larger than average. Consider the ways in which that interaction is both framed by and constructive of a lack of trust between community and law enforcement. Everything said, every action, is a reproduction of the larger systemic sin and a personal act that reinforces the reality of that sin. The very first recognition from Davis that a police car was stopping involves a systemic memory of power imbalances between police officers and others in the African American community. The radio report that someone had robbed the convenience store creates a context where Wilson anticipates the Hulk Hogan interaction. All of this reproduces the sin in the situation and translates it from potential action to personal choice. The personal act then justifies the legitimacy of the social imaginary. The sin is not solely present in the individuals but is transmitted through them and by them in tangible ways. The Wesley definition of sin comes from his sermon “On Perfection“, delivered in 1872. It’s a sermon in response to the critics who said that perfection of life and heart were not possible. He argues that God is at work in the individual, but I think he’s also saying that God is at work perfecting the larger social imagination. Wesley asks a poignant question about why his hearers might choose to continue in sin. I think this passage also speaks to the larger social conditions through which sin is shaped. God is willing to heal both the individual and the structural. It only requires us to break the discursive narratives that allow us to replicate structural injustice while justifying personal action. Both require forgiveness but we say that God’s grace is greater than our sin. When the scripture says, “whatsoever things are true…think on these things”, it may be the key to rewriting the structural and personal narratives. We call that repentance.